In celebration of achievement and hard work and to confer well deserved degrees, Northrise University held its 11th Graduation ceremony on 2nd June, 2018. 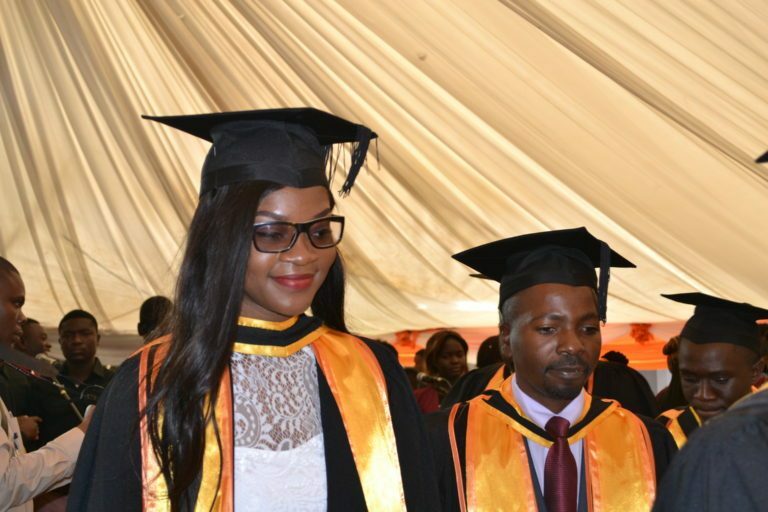 In flamboyant regalia, 73 graduates majestically walked the stage as each doffed to and greeted the presiding Chancellor, Mrs. Zimba – Deputy Vice Chancellor, to receive their award. The guest speaker, Dr. Lazarous Phiri – President of Evangelical University – called the graduates ‘gospel warriors’. He urged them to be faithful to God and demonstrate the gospel as Zambia is in desperate need of authentic leadership. Quoting Mr. “I’ll be back”; Arnold Schwarzenegger who said “Just remember, you can’t climb the ladder of success with your hands in your pockets”, Dr. Zimba – Vice Chancellor of Northrise University – implored the graduates to climb the ladder of success with their hands railed in by serving in their various communities and institutions, with their skills and talents to transform the nation of Zambia. He charged them to guard the good deposit entrusted to them by deposit their lives with Christ; the only true way of investing their lives successfully and the only investment with 0% risk and 100% returns. The 2018 Valedictorian, Eng. Dean Lameck Musukwa (MBA), recounted fond memories of his enriched experience and that of other graduates. Praises to God and gratitude was on the lips of the many guests and parents who were equally joyous. One parent in particular; Rev. Simutowe, was so excited to see his daughter Dorcas graduate. He stated that words felt insufficient to express his joys. He commended the University for not merely educating his daughter but for molding her into a young woman with virtues. Through hard work, the 73 have finally reaped their harvest! Hard work sure does pay off, their tassels where worth the hassle. Congratulations class of 2018!